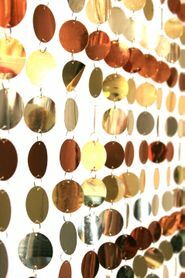 Our beautiful new "Spangles" circles beaded curtain is made out of awesome metallic PVC circles and is very lightweight. 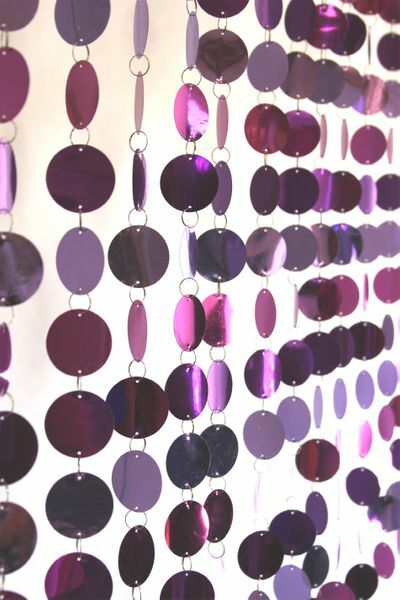 Each bead is attached to the next using jump rings, which makes this curtain very easy to make longer if you wish. You'd just purchase additional curtains and add the strands using the jump rings. Easy as pie! The Metallic PVC Circles are 1.5" in diameter. There are 12 strands on each curtain. This curtain is perfectly lightweight, making it a great item for hang for your special events too! IT will shimmer and shake with a little bit of breeze, which makes the room really come alive! The rod is 34" wide and the length of each strand is 6". On this style of curtain, the hanging hardware (the metal eyelets at the top) slide back and forth on the rod making it the PERFECT curtain to alter in width! So if you need to cover a space that's 47" wide, you would use two of this curtain. Just cut the second curtain down and hang it next to the first curtain. This will look like you've got just one perfect curtain hanging up! This curtain features various purple hues alternating all the way through! VERY wonderful colors, and it will make matching your purples a breeze. Arrived quickly, easy to install and my daughter is very happy with her closet. Would like a few more strands on the set so it is fuller looking. Worked perfectly for what I needed them for! I just redid my daughter's room in gold and purple and I hung a sheer gold curtain in her window and then hung (2) spangle curtains side by side over the sheer gold curtain. Looks great! My daughter loves the way they move and sparkle in the light and when her fan is on.